The image depicted ten hooded men with their heads in their hands on their forlorn ferry route to Turkey. Standing just over the migrants, ten shaven-head FRONTEX security officials with surgical masks over their faces: as if to suggest a disgust in breathing the same air as their charge. Each official wore bright blue armbands emblazoned with a ring of gold stars and under their blue indicatory FRONTEX jackets, a full military uniform of black boots, black trousers and a black coat. The armband symbolism and official use of the colour black a frightening reminder of a previous era of mass-expulsions. Back in Greece, a Turkish activist called Baran Doğan campaigning for local refugees, referred to the deportation as the “bargaining and bartering of human bodies… it’s treating humans as goods”. Winding backwards, on the 18 March, 2016, heads of state or government from the EU and Turkey agreed to “end the irregular migration from Turkey to the EU” and instead replace it with “legal channels of resettlement of refugees to the European Union”. The central aim: to replace “disorganised, chaotic, irregular and dangerous migratory flows by organised, safe and legal pathways to Europe” for those entitled to international protection in line with EU and international law. The agreement took effect as of 20 March 2016, and the 4 April 2016 was set as the target date for the start of returns of people to Turkey. The Commissioner for Migration, Home Affairs and Citizenship, Dimitris Avramopoulos, of Greece and the EU, said that, “we now need to honour their commitments and ensure an orderly, well managed and safe arrival and admission to Europe”. The agreement stipulates that all asylum seekers, or “irregular” migrants are to be “returned” to Turkey, which had been deemed a “third-safe country of residence”, supposedly in full accordance with EU and international law (though ultimately amounting to collective expulsions forbidden under international refugee law – according to the UN). I might add that we keep this in mind as an instance of the law being adapted to suit the case rather than the case being adapted to be brought in line with the rule of law, or how illegality becomes legitimized, as I will discuss shortly. The draft statement for the agreement on the 18 March 2016 stipulated that “this will be a temporary and extraordinary measure which is necessary to end the human suffering and restore public order”. The treaty renders Turkey as a “third-safe-country of residence”: a territory outside of EU jurisdiction, but a territory which acts to manage the flows of migration within the EU, restoring the Schengen Area’s ‘normative order’, with Donald Tusk declaring that this agreement was about “strengthening the EU's external borders, keeping the western Balkans' route closed and getting back to Schengen”. Equally, the “third-safe-country of residence” designation shifts the state of Turkey, as an outlier or “neighbour” of the Union, to a space of liberal management, giving Ankara a role in the EU’s border agency FRONTEX – subcontracting border control, essentially creating a hub for the deported while also facilitating detention and surveillance of those seeking to gain entry to Europe. 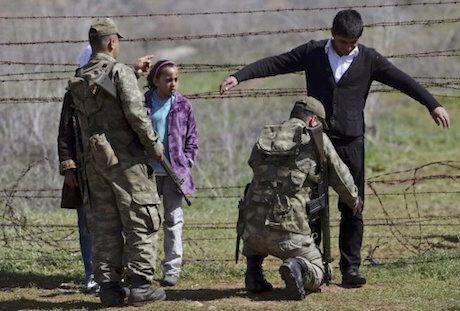 For every Syrian sent to Turkey, one will be repatriated and given asylum in the EU, for anyone else, including large amounts of Eritreans, Iraqis, Afghanis and many others fleeing war and conflict, the possibility of Turkish government deportation remains high. There are two ways to look at the current method of dealing with the ensuing migration crisis. One is to consider the EU’s actions in humanitarian terms: to consider that the circumstances are exceptional, where the EU evokes a responsibility to the crushing poverty, suffocating crowdedness, and overall suffering of the migrants affected, who are left to wait on the edges of Europe. The other is to consider that the migrants amassed on its borders are detrimental to the security of the EU and on those terms, the responsibility of the EU to the lives of the migrants shifts from being solely humanitarian to existing within in a dual role where security becomes as paramount as humanitarianism. This collapsing of ‘security into justice’ would call into question the terms by which liberalism itself operates. If the securing of territorial integrity is collapsed into the protection of migrants, it plays into anti-immigration rhetoric which continuously recycles the figure of the “migrant” and the figure of the “terrorist”, which has its roots in the liberal, legal exceptionalism stemming from the Bush administration’s War on Terror. We might then refer to this agreement as an EU experiment in search of an optimal balance between maximum control over its territory and minimum responsibility to the people within it. Equally, as is similar to the point made in the expansion of the FRONTEX processes, the use of Turkey as a “third-safe space” is a problematic continuation and exacerbation of the externalization of responsibility, where the EU uses an archipelago of camps and networks to facilitate migrants – where Turkey stands as a kind of sovereign migrant processing facility in its own right, or as Didier Bigo would refer to it, a space for the management of unease, fear, and suffering. The immediate goal of this agreement is at once to ‘secure’ the unfolding humanitarian catastrophe that the migration “crisis” presents through the “quiet” means of mass-expulsion – within the remit of “acceptability’ through the veneer of international law. Though the EU may be seen to be abiding by the terms of international law, the law itself is actively being manipulated to suit the supposed necessity to “end the human suffering” of the crisis by sending asylum seekers to a place where the risk of deportation to the war they originally fled from is high, all in contradiction to international refugee law. These new exceptional measures of mass expulsion are not themselves adapted to suit the rule of law, the rule of law is itself adapted to suit the agreement. Legitimizing, on moral and humanitarian grounds and through such language as “crisis” and “necessity”, illegality. The legitimacy gained fine-tunes the backdrop of liberal freedom through the balancing of control and responsibility through buffer zones and exceptional grey areas. The agreement statement declares in full that, “it will be a temporary and extraordinary measure which is necessary to end the human suffering and restore public order”, as before. Yet, if we are to consider it on the terms I have articulated above, the agreement itself becomes less about the rights of the migrant and more about the restoration of order in this tumultuous ‘zone of turbulence,’ and ultimately, the continuation of business as usual in the EU. The consideration of the migrant as an entity which instigates the strengthening of a border, as Donald Tusk and the EU has insinuated, has required an urgency and imperative character precisely because it is linked the to idea of self-defence (“crisis”) and survival (necessity based on humanitarian grounds), which only further pushes the figure of the migrant into the realm of the figure who causes fear and terror in the EU’s jurisdiction. The exceptional language used to deal with this figure normalizes the use of security and militaristic techniques and thus legitimizes the mass-expulsion of migrants. The response to humanitarian catastrophe with security becomes associated with exceptionalism and danger, and the EU then begins to manage ‘risk in order to discipline the future’ and excludes and oppresses the ‘other’ for the sake of securing ‘the self’. The binding of security to humanitarianism, as is the case with this EU-Turkey agreement, exposes its underlying aim of maintaining the economic trade integrity of the Union. In this sense, the protection of the liberalism of Europe becomes embroiled in a complex and problematic exchange, where the lives of migrants are sent back to ‘where they came from’, in the dehumanizing process of expulsion, which treats “humans as goods”, as Baran Doğan, the previously quoted Turkish activist states. Even under the umbrella of humanitarianism, the EU is demonstrating a blind disregard for human rights as well as pushing the means of exception beyond its previous boundaries.